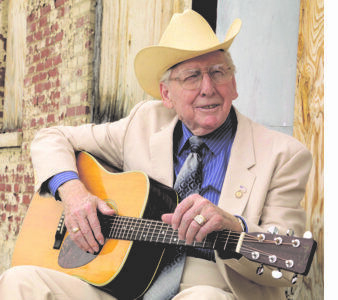 Bluegrass pioneer Curly Seckler, 98, passed away Wednesday morning. Born John Ray Sechler, "Curly" was born on Christmas Day, 1919. His soaring tenor vocals and trademark mandolin style were a major part of the 1950s Lester Flatt & Earl Scruggs' Foggy Mountain Boys. He also performed with Jim & Jesse, The Stanley Brothers, Jesse McReynolds and others during his 77 year career. He began his musical career in 1935, in a band with his brothers, Marvin on guitar, George on fiddle, and Duard ("Lucky") on guitar. Curly played the tenor banjo. They called themselves the Yodeling Rangers (later changed to the Trail Riders). In 1939, they landed a daily radio show on the new station in Salisbury, WSTP. Later that year, Curly was recruited by Charlie Monroe to be the tenor singer for his new group, the Kentucky Partners. They appeared on the WWVA Jamboree in Wheeling, WV and on WHAS in Louisville, KY.
Seckler was renowned as one of the pioneering tenor singers in bluegrass, including 12 years with Flatt & Scruggs' Foggy Mountain Boys and 21 years with the Nashville Grass. Seckler was best known for his work with the Foggy Mountain Boys, during which he recorded well over 100 songs with them, including most of their best know classics. His instantly recognizable tenor vocal harmony was the perfect match to Lester Flatt's distinctive lead singing. Their duets on favorites such as "Some Old Day," "What's Good For You," and Seckler's original, "That Old Book Of Mine," set the standard for generations of bluegrass singers that followed them. The first generation bluegrass artist celebrated his 75th anniversary in bluegrass music in 2010. He was inducted into the International Bluegrass Music Hall of Fame in 2004, the North Carolina Music Hall of Fame in 2010, and the Bill Monroe Bluegrass Hall of Fame in 2011. Though the Nashville Grass officially disbanded in 1994, Seckler and Spears have performed together a number of times over the last eight years, including at the Bill Monroe Centennial in Owensboro, KY in September of 2011. For this performance they were joined by well-known Nashville musicians Johnny Warren on fiddle, Charlie Cushman on banjo, John Tomlin on mandolin, and Kent Blanton on bass. Seckler first performed on radio in Salisbury, NC in 1935, ten years before what is now considered the first bluegrass band came together under Bill Monroe's leadership. Seckler had been in declining health after suffering strokes in 2013 and 2014. He did release a biography, “Foggy Mountain Troubadour: The Life and Music of Curly Seckler” by Penny Parsons in 2016 which illustrated the vast career that he had.